The Diversity and Inclusion Professionals Certificate allows you to gain in-depth knowledge of contemporary and emerging trends in Diversity and Inclusion (D&I). This profession is highly specialized, complex and vital to an organization's mission. 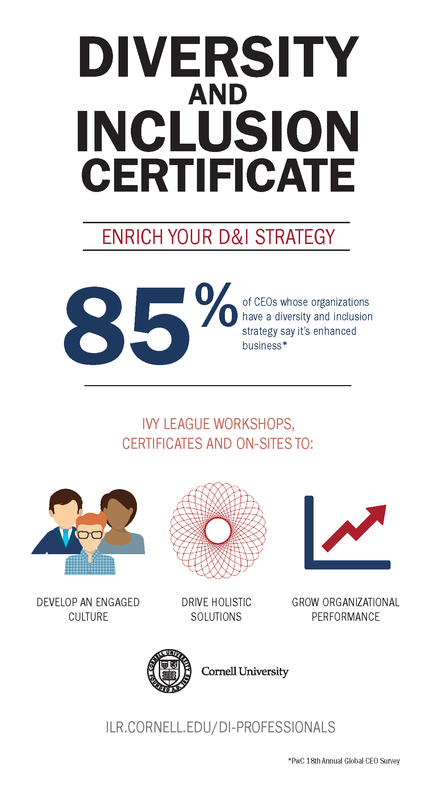 Develop skills to link D&I to organizational effectiveness and business performance. It is recommended that participants take The Law of EEO first. The Law of EEO can be applied to this certificate if also completed for the EEO Professionals Certificate. Other workshops may only be applied towards this certificate. In response to the growing complexity and depth of the field, ILR developed the Cornell Certified Diversity Professional/Advanced Practitioner (CCDP/AP) Program. This certification provides experienced professionals with a minimum of three to five years of experience an opportunity to promote individual growth and organizational success through deeper knowledge, honed skills and additional D&I strategies.